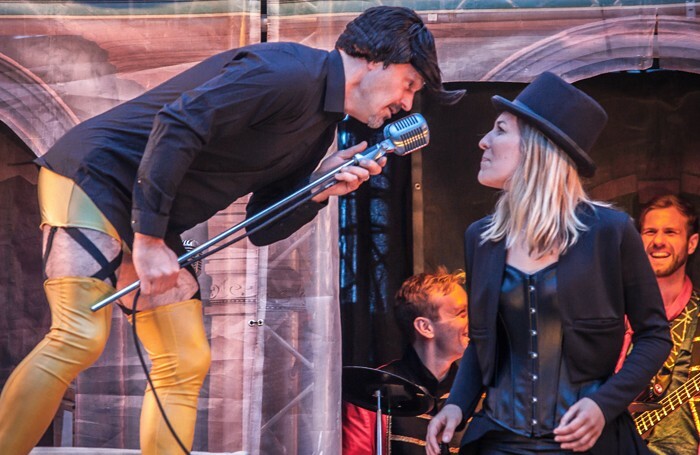 The traditional Shakespearean plot of a seemingly impossible and implausible love triangle is not entirely lost in Oddsocks’ touring Twelfth Night. Madcap capers and jovial antics are plentiful in this fabulous piece of family-friendly outdoor theatre. And, of course, the great outdoors becomes a character in itself, with the company’s proficient and personable ensemble not dampened or deterred by a downpour during Act II. Gavin Harrison is a cool gangster of an Orsino in white suit with black tie and shades, while Andy Barrow excels as the pompous Malvolio with carefully coiffured quiff. His role includes a Tati-esque encounter with a stepladder and some maudlin Morrissey melancholy. He croons “Olivia Knows I’m Miserable Now” when he is deemed mad by his mistress. Indeed, the musical interludes really give the show its novelty and strength, with a mixture of indie, heavy metal, punk rock, ballads and electro-pop classics woven into the narrative seamlessly. The costumes are frequently hilarious, such as Sir Toby’s traffic cone as headwear, Sir Andrew’s star-spangled clown suit and silly sombrero, and Malvolio stripping down to bright yellow garters and boxer shorts. Rebecca Little and Peter Hoggart make spitting images of each other as brother and sister Sebastian and Viola, to much amusement, while Lucy Varney deliberately overacts in her role as Olivia with a great stage presence that captures the audience’s hearts. And it should be said that, despite the wind, rain and motorcyclists in the park to compete with, not a word comes out without clarity and confidence.